Looking to entertain guests with beverages at a trade show, business function, or event? 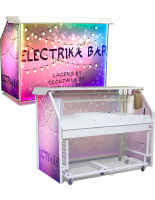 Many venues are lacking pre-existing drink areas which is why our portable bars are a great solution for offering libations to guests, clients, and event attendees. 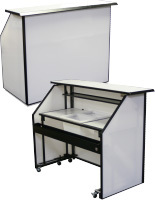 These units can easily be picked up and taken on the go — making them ideal for any temporary setting. 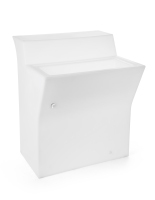 The folding design gives our portable bars the ability to be stored in any space and assembled with ease. Each unit in this category features wheels for added mobility. 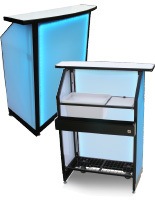 Our folding portable bars will not only benefit the user but consumers will take advantage of the convenience it brings. 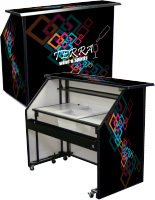 Browse our large catalog of beverage carts today! 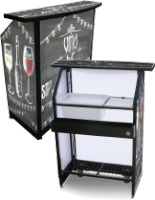 What are some features of these drink stations? 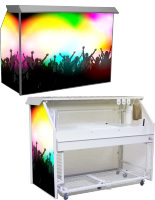 Our portable bars are available in three different sizes: 40”, 62.75”, and 65”. 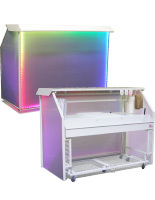 Each option is purchasable with LED lighting or both lighting and custom text/graphics. 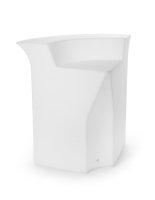 Customers can opt for a plain white model as well if they don't need the extra design attributes. A variety of accessories and features in our units give you everything needed within arm's reach. A few contain bottom storage which is ideal for holding extra beverages, mixers, and garnishes. 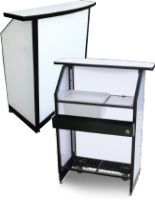 Ice bins and cutting boards give bartenders room to operate as well as remain stocked throughout an event. 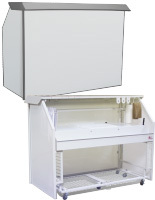 An auxiliary folding shelf, cup/towel racks, and knife holders are other useful features included in most models. These product highlights assist bartenders in storing the necessary tools in places where they can be accessed quickly. Users can also store bottles in the sunken speed well to create extra counter space. Hidden locking caster wheels allow exhibitors to easily reposition the carts and keep them in place when setting up a booth or event. Why should you choose these extra design features? It’s important for any drink station to stand out to convention attendees and potential customers. Front panels with custom graphics offer full-color printing to showcase a company logo or brand. Develop artwork to match the theme of a banquet, exhibit, or event. Adding customized images is just another opportunity to make an impression — by placing graphics on the bar, customers will remember your brand and your mission. Using our tables with LED lighting is a way to add an extra touch when trying to catch the eye of trade show attendees or event goers. 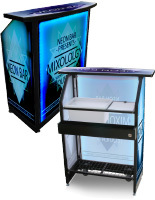 Impress potential clients and go the extra mile by incorporating special lighting and images on the front of your drink station. Pair these beverage carts with stools and tables to complete any lounge setting. 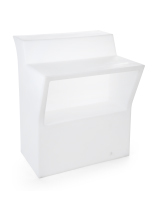 Extra seating is ideal for those who are looking to relax and grab a few drinks during a busy event. Create an impromptu parlor or tavern environment by adding these furnishings. 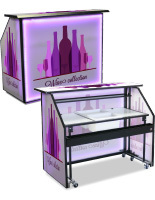 A trade show booth can quickly become a hot spot with the combination of a lounge and pub table sets. Shop online at Displays2go to take advantage of quick shipping and low prices!